Providing the Northeast Ohio area with professional, fast and eco-friendly junk removal services. Painting a room is a terrific way to spruce things up. 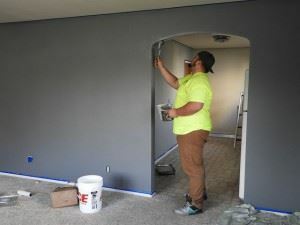 If you have the opportunity to paint your house before you move in with empty rooms, then all the better. However, that shouldn’t preclude you from taking on a DIY task of painting a room. It all comes down to the prep. First, you want to remove all the furniture. If that’s not practical, then push everything into the center the room and cover it with a plastic tarp. Next, remove any fixtures or hardware that might get in the way. That includes switch plates, door hinges and curtain rods. It takes a little time but it’s worth the effort especially when you don’t get paint splashed on those things. It may seem counterintuitive to clean the walls that you’re about to paint. The reason is that grease, dust and grime can make it a challenge for paint to bond to your walls. That in turn can cause streaks. You should take a dry cloth a damp sponge and go over all the walls to remove that layer of dirt. As you wipe down the walls, you should be on the lookout for any nail holes or gouges. These should be filled in with spackle and then send it over to make smooth. Even if you intend to rehang photos in the same spot it is better off that you make the repairs in the wall just in case you change your mind. Now that you’ve removed obstructions, clean the walls and made repairs you’re ready to put down the painters tape. First, put down drop cloth. That can either be a literal drop cloth like old sheets. You can also use plastic and paper found in roles at any hardware store. This should all be taped down so it will come up during the painting process. You then want to use painters tape along all the baseboards, moldings and any built-ins. What you’ll be left with is clean paint zones that will be easy to cover. You’ll find that the actual painting will take a lot less time than the prep work but it is definitely time well spent. It might also help get rid of any unwanted clutter before you begin the process. The less you have to move around the better off you’ll be. This is a task you don’t have to take on as a DIY project. Instead, turn it over the Junk King Cleveland. There provide you with the manpower and the truck space needed to get rid of all your rubbish. The best approach for prepping your room for painting is a call to Junk King Cleveland. This entry was posted in Cleveland Junk Removal and tagged Clutter, painting, prep on August 27, 2017 by Junk King. Last updated August 27, 2017 .